Hi all, my original drive is a Samsung EVO 860 m.2 SATA. I just upgraded to the EVO 970 Plus and have successfully cloned the old drive to the new one. I removed the 860 and the system boots fine off the 970 without issue. I would like to format the 860 drive in order to sell it, however with both drives installed together the only option in the BIOS is to boot off the old drive. In Windows it reports a "signature collision". So is there any way I can format the old drive? By the way, the Motherboard is the Gigabyte Z390 AORUS Pro. BIOS screen, showing the only boot option as the old 860 drive. 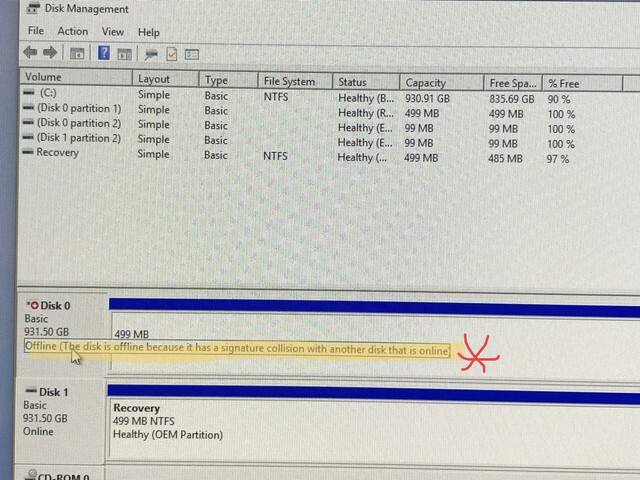 In Disk Manager (Win10) showing the signature collision message. By any chance did you clone using the samsung migration app ? Try rt cl the drive and selecting on line, ignoring the warnings. Get yourself a USB to SATA cable. It’s an m.2 drive, isn’t that a different interface?? Yes I did use the Samsung Migration application. I’m sorry what does “rt cal the drive and selecting online” mean? It sure is. My apologies. Download the free version of Easeus https://www.easeus.com and try the partition tool. 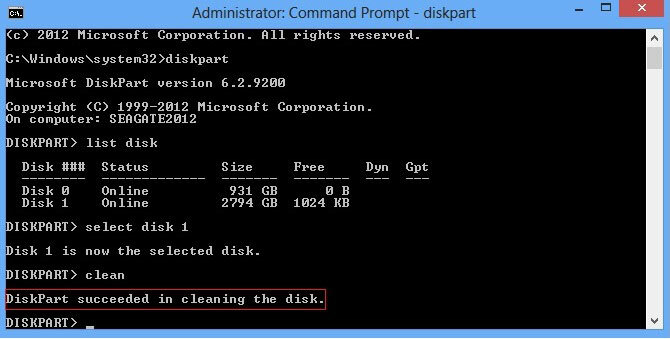 Boot from windows installation media and use diskpart to clean your old drive. Thanks for that. Although I’m not sure that gets round the issue of the ‘signature collision’. It might be a limitation of the motherboard / data channels / whatever which I’m hoping someone with more knowledge than I have can help with. I’m not sure that gets round the issue of the ‘signature collision’. Cloning produces identical copy of the drive (including drive signature). That's why you're getting conflict. Clean your old drive and there will be no more conflict. Not quite, not all cloners,. Macrium does not create this problem for example and the only app that does is samsung. I remain surprised so few users are aware of its limitation. Remove your new drive install the old one, and boot from a Windows installer USB (just create one). You don't even need to go to the command prompt, just go to start the install and at the disk management screen delete the partitions and format the drive, and then cancel the install. Shut down, remove the usb and the drive, reinstall your new one and done. at least yours booted lol, I have the aorus pro wifi z390 and I currently have a 860 evo m.2 installed with the OS in the smaller 2280 M.2 slot, I tried adding a 970 Pro NVMe m.2 to the additional larger 22110 slot on the mobo and the pc wouldn't even post, go into windows, no bios no anything, so im currently on another thread trying to figure out why when I have the old SSD (860 evo) installed, and try adding the new 970 Evo to the other open m.2 slot (even tho its 22110 bigger slot I spoke to gigabyte and they said it can take a normal size 2280 m.2 drive) it doesn't do anything but turn on, then shut off, then try to turn on again, shut off, rinse repeat until I finally stopped it lol I didn't want the 970 pro to be a boot drive or have my OS on it, I just wanted it for additional storage. but gigabyte said it would work fine but it obviously doesn't even boot and trying to find out why that is and haven't found a single answer yet! Question 4 Disk drives installed, one is missing. Accessing old C drive with new C drive installed.